By: John Heijligers, Art Director for EIT Digital at Eindhoven University of Technology. Creating engaging videos is one of the greatest challenges for online teaching, as video can create learning experiences that go beyond the classroom. 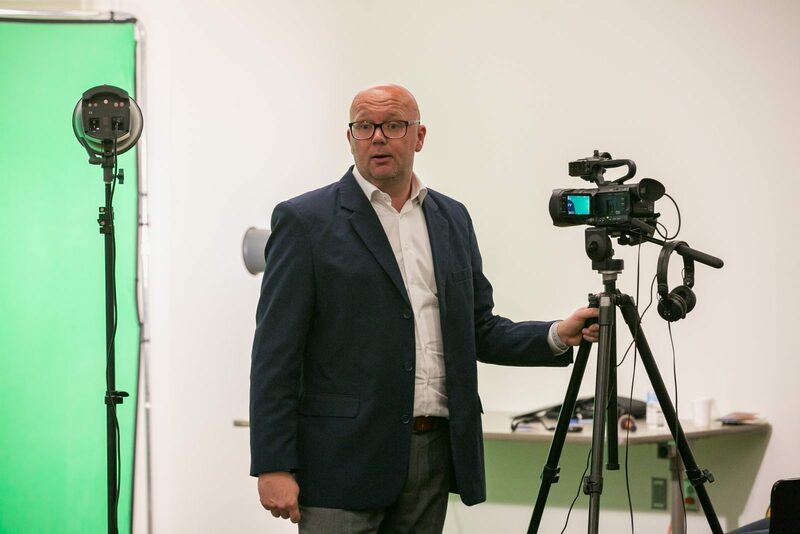 The instructor’s enthusiasm and passion for the topic is crucial when it comes to creating an engaging video. At the University of Technology in Eindhoven, studios are equipped with cameras, a green screen, lighting, and a large edit bay. This array of tools sometimes makes novice online instructors anxious. When instructors work to develop on-camera skills, such as voice and breathing techniques, they become more effective online teachers. These skills don’t always come naturally, but they can be learned. In our training programs we highlight the importance of enthusiasm and focus. The learner should always come first! A good way to shift an instructor’s focus to learners is to ask key questions. Who are your learners? Are they beginners or experts?? What do they hope to achieve? Contrary to some instructors’ expectations, teaching in front of a camera is a very different experience from teaching in a classroom. In order to empower instructors to teach effectively on camera, it’s important they review their own videos in order develop a strong self-awareness of their delivery and communication style. Nervousness usually impacts performance and delivery. Fortunately, there are ways to alleviate this. First, acknowledge that it’s okay to be nervous! Next, go over the video production process step-by-step before you perform. Don’t forget a good warm-up — it can go a long way. You’ll feel better if you feel prepared before you go on camera. When instructors are passionate and enthusiastic, they form connections with learners that boosts motivation. One simple way to achieve this is smiling! Smiles at the start and end of a video makes a difference because it communicates openness. To add happiness to a video, we’ll sometimes place a stuffed animal near the camera and introduce some fun to the filming process. Can MOOCs make you seasick? Watch this to find out. Avoid sitting down when you make your first appearance on camera. Being seated can lower your energy level and impact your delivery. Don’t wear busy patterns, such as small squares, dots or stripes. This can result in a Moire effect, which causes video to blur. Avoid green clothes when you work with a green screen. Don’t mumble your words! Try to speak clearly and pronounce every syllable. Don’t use complicated terms or long words. These may look good on paper, but they make your delivery less natural. When you practice reading your script, look for opportunities to make it more natural and conversational. I work with instructors from all over the world. I always enjoy seeing how a little guidance, coaching and practice, can help them bring their confidence and passion from the classroom into the studio. Learning these techniques can help instructors become better and more effective teachers online.